The Snowdonia National Park provides a mighty natural backdrop to this walk, which will enable you to discover picturesque seaside towns, dramatic estuaries, woodlands and miles of sandy beaches. Along the way you will also have an opportunity to visit the Ffestiniog Steam Railway, Portmeirion, Harlech Castle, and the iconic seaside resort and university town of Aberystwyth. You also have the option of using the Cambrian Railway if you run out of steam yourself! The train also gives you various other options, such as parking your car at the end of the walk in Aberystwyth and taking the train up to Porthmadog to start the walk. Overnight at Porthmadog at the Tudor Lodge Hotel, or one of equivalent standard depending on availability. Set off on the first section of the walk across the Cob (the artificial railway embankment) that bridges the Glaslyn estuary. If you are lucky you may see one of the Ffestiniog Railway locomotives steaming alongside you. At the other side you will climb up onto the headland on which Portmeirion is built, famous as the setting for the psychedelic 60’s TV series, “The Prisoner”. If you wish to spend some time exploring this eccentric little village with its cafes and gift shops, you can pay the entrance fee of £11 per adult, otherwise the path skirts around the perimeter of the village. From Portmeirion you walk to the Brevit Bridge across the estuary . 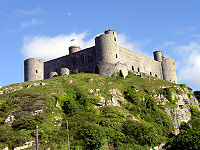 This walk takes you through marshes, and over rivers until you reach the town of Harlech, famous for its splendid Edwardian castle which you can visit for a modest fee of £4.25 per adult before spending the night in the Maelgwyn House B&B (or similar). The route takes you along the edge of the Royal St David’s Golf Club, through the dunes and on to the Morfa Dyffryn National Nature Reserve. Here you are following the tide line and on a good day you will see the whole of the Llŷn coast. Overnight in the Morwendon Guest House in Llanaber (or equivalent). Head south from the hotel to Barmouth, following the path along the seafront to the toll footbridge over the delightful Mawddach Estuary and on through marshland to Fairbourne to stop for lunch. The path then climbs up into the hills past standing stones and cairns. Walk to the train station and Llwyngwril and catch one back to Llanaber for your second night at the Morwendon. Check out of the Morwendon and catch a train back to Llwyngwril. Continue south from the town running roughly parallel to the coast. After about 6 and a half miles you will cross a foot bridge over the Dysynni river and then onto an area of flat land as you head into Tywyn where you can stop for lunch. From Tywyn return to the coast and walk south through the dunes to Aberdovey. Spend the night at the Fron Haul B&B (or similar). Head north out of Aberdovey up into wooded hills. Stop for lunch at the Riverside Hotel in Pennal. From Pennal it is hills and woods until Machynlleth, an interesting town, famous as the stronghold of Welsh rebel Owain Glyndwr. Accommodation at the Maenllwyd Guest House or similar. Follow lanes and forest tracks, some with sweeping views over Cardigan Bay to Tal-y-Bont where you will stay at the Tal y Bont Bed and Breakfast or similar. Return to the main path along the Cors Fochno marshland. Take the bridge over the Leri river and return to the coast at Borth for lunch. The rest of today’s walk is along rocky coastal cliffs with great views into Snowdonia’s mountains as you head south to Aberystwyth. 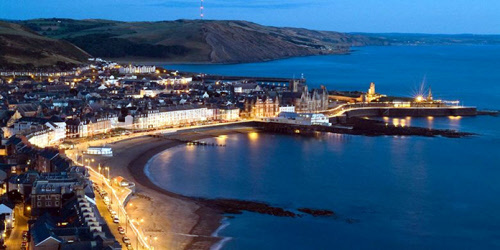 Aberystwyth has a number of attractions including a Castle and Hill Fort, Museums and Galleries, a Funicular Railway and the National Library of Wales. Spend the last night of your holiday at the Glyn Garth Guest House or similar. Our price for this holiday, including B&B accommodation for 8 nights for an adult sharing a twin or double room would be £650, with a single supplement of £20 per night. This itinerary offers a different place to stay every night with your luggage being carried for you. However, the special feature of this part of the Wales Coast Path is how easily it can be accessed by train. This enables customers to locate themselves at a chosen hostelry and simply travel by train on some of the days back and forth to the route to avoid having to repack every night. If walkers would prefer this on part of the route then there would be a saving on luggage transfer costs which we can pass on to you. Please enquire for details.